Our Rustic Candle Collection Jars offer the combination of rustic wood tops with long-lasting, highly scented candles. Choose from 10, 16, and 26 oz. sizes. We're sure to have the Candle Jar that's right for you! •Specialized Candle Molds for recognition dinners or special events. Without the support of friends, family, community, and customers like you, our company would not be where it is today. Saying "Thank you" doesn't seem enough when considering the hard-working team of people that volunteer their time and expertise to the company. The Flat Rock Candle Company is committed to creating quality, "scent-sational" candle products. All of our products are hand-poured and slow-cured in small batches-ensuring higher scent retention for the life of our candles. Each candle is made from wax that is specially blended and contains only the highest quality fragrance oils that are free from animal testing. Our wicks are lead-free and are supported by stabilizing threads ensuring a straighter burn. Best of all, they're virtually self-trimming; helping to reduce smoke and soot build-up found on most commercially made candles. 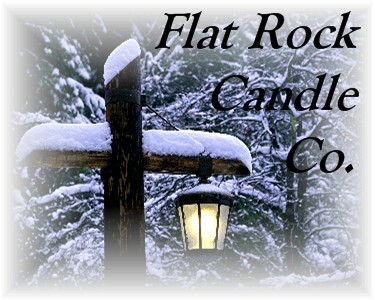 From everyone here at the Flat Rock Candle Company, thank you for your comments and continued support. We look forward to hearing from you or seeing you at our next vendor event!